This one I love. My (now) sister-in-law brought some Peppermint bark to Christmas dinner a number of years ago and it was fantastic. And since I have no idea if she'll be bringing any this year, I made my own. 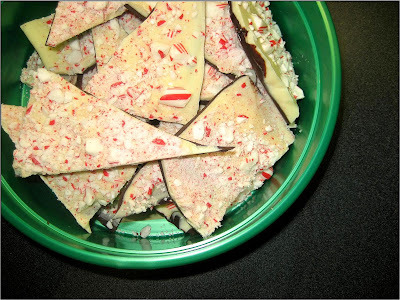 It was super easy, and if you like Peppermint bark, I suggest making it yourself too. This version has both white and dark chocolate (I honestly can't remember if the first batch of bark I had included dark chocolate). I like the contrasting flavors of the sweet white chocolate and the bitter dark chocolate. It goes very nicely with the minty candy canes on top. Yummy! 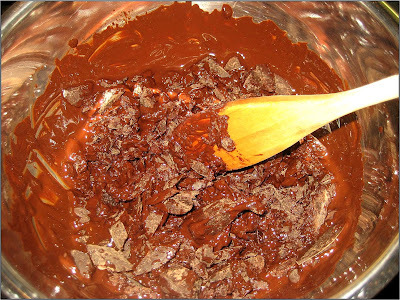 This is easy to make - melt the dark chocolate, layer on a baking sheet (lined with parchment paper) and stick in the refrigerator to harden. Then melt the white chocolate and layer on top of the dark chocolate. Top with chopped candy canes (press down to get them to stick). 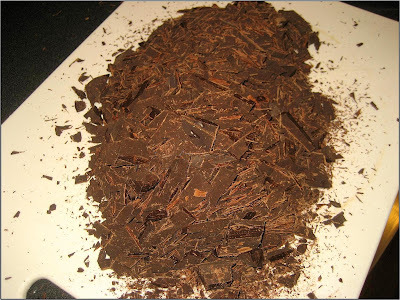 Back in the refrigerator to harden, then break up the bark with your hands.